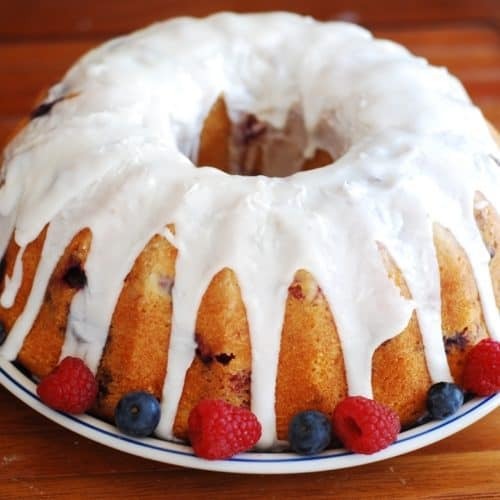 Mixed Berry Bundt Cake with Lemon Glaze – this cake is made with 3 types of berries all combined in one beautiful cake: blueberries, raspberries, and blackberries. It’s a perfect Summer bundt cake that can be made with either buttermilk, or Greek yogurt, or Kefir. This recipe uses 10-cup bundt pan. 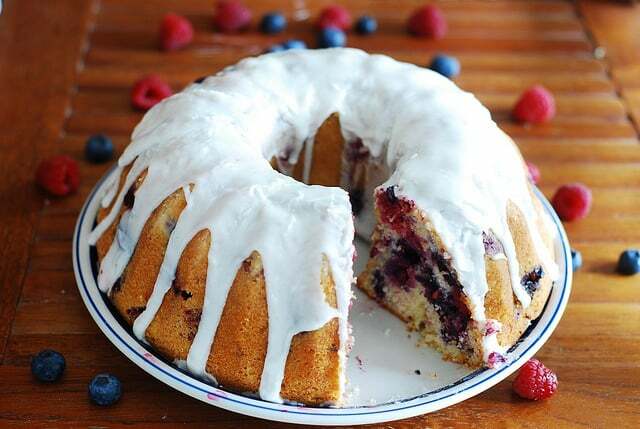 I discovered this triple berry buttermilk bundt cake recipe on one of my favorite food blogs, Smitten Kitchen. 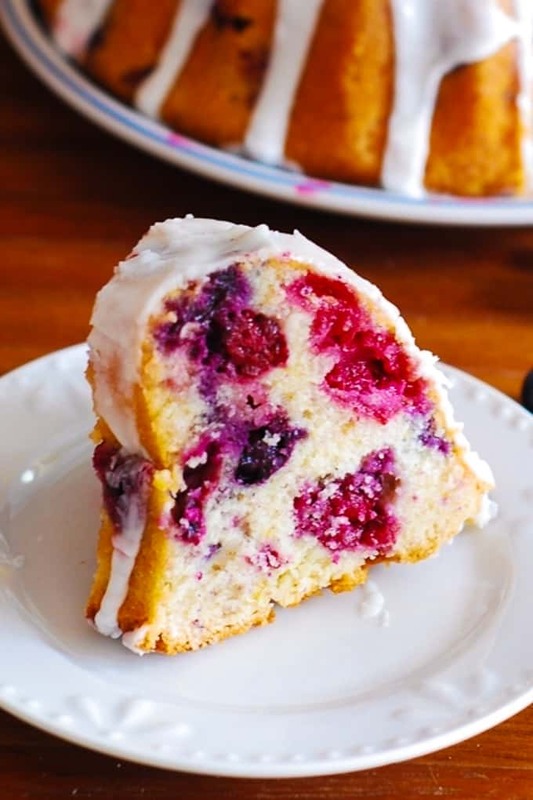 When Deb published that blog post, I found myself coming back to her site, just to look at her pictures of this mixed berry bundt cake full of blackberries, blueberries, and raspberries, and not being able to easily forget it. Deb’s pictures made it look so enticing that I made this cake 3 times in the last 3 months. And the only reason I didn’t make it even more often is that there is only so much cake that one family can eat! Each time it was with different friends, and each time it was a huge success! The only change that I made to the recipe was to use Greek yogurt (once I used Kefir, too) instead of buttermilk. 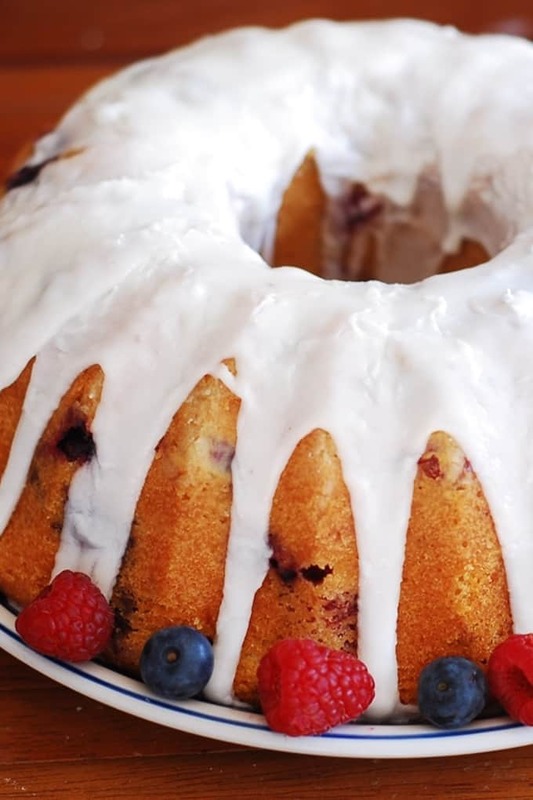 While this mixed berry bundt cake is perfect when made with fresh berries in the Summer time, I’ve made it both with fresh and frozen berries (without defrosting them). And by frozen berries I mean fresh berries that I froze myself, so that each berry remained separate and not clumped together. So, this recipe will work great both with fresh berries and frozen berries (as long as they are separated and not clumped). 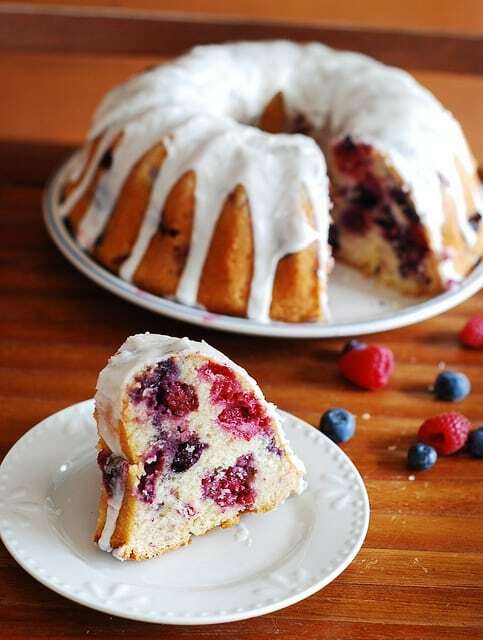 This makes me very happy, because it means that I can enjoy this mixed berry bundt cake BOTH in the summer AND in the winter. 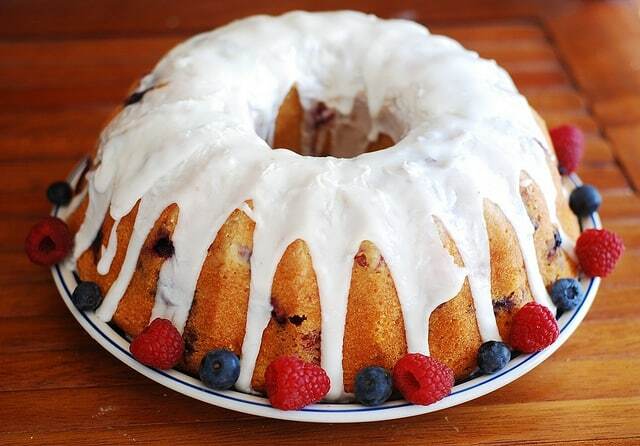 This triple berry bundt cake also makes a beautiful presentation and is VERY easy to make. Use slightly softened, not melted better! The butter should still be able to retain its shape! It should almost be on the firm side but soft enough for you to whisk it using the electrical mixer. Use electrical mixer and whisk powdered sugar, lemon juice and butter until very thick and very white. To make double sure that your glaze is thick enough, you can put the bowl with the glaze to the freezer for about 15 minutes to make it harder. Make sure the cake is completely cooled off before applying the glaze. If the cake is even a little warm, the glaze will melt and will be runny. What is a substitute for buttermilk in baking? Greek yogurt, Kefir and buttermilk are good substitutes for one another, so using either one will work in this recipe. Below are some helpful step-by-step photos of how I made this cake. Next, in a separate bowl, mix the berries with 2 tablespoons of flour. This helps so that they don’t sink to the bottom of the bundt pan and don’t clump together. Bake your bundt cake at 350 F in the preheated oven for 1 hour or 1 hour and 15 minutes until the toothpick inserted into the center comes out clean. Mid-time through the baking, turn the pan around in the oven for even baking. Sometimes the cakes get stuck to the bundt pans and it seems impossible to get them out without ruining them. So, how do you get a cake unstuck from the bundt pan? Or, how do you successfully release a cake from bundt cake to begin with? Follow the below instructions and you will be able to get your cake safely out of the bundt pan! 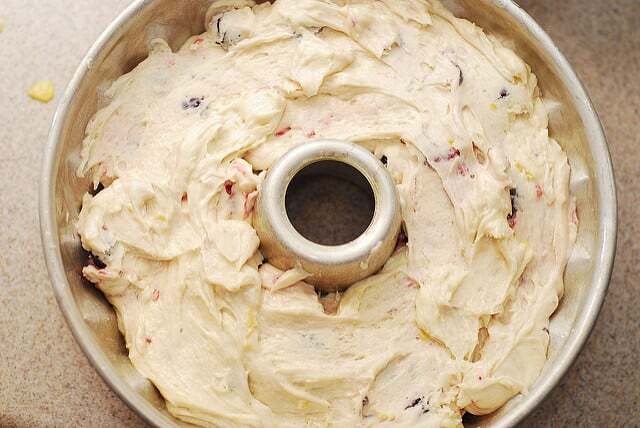 Before you add the cake batter to the bundt pan, make sure to spray you bundt pan with a baking spray, preferably the one that contains flour. After you baked your bundt cake, remove the pan from oven, and let the cake cool in the pan for 40 minutes on wire rack. After your bundt pan has cooled off for 40 minutes, place the bundt pan (with the cake in it) in the freezer for 30 minutes – the bundt pan will still be quite hot to the touch (even after 40 minutes of cooling), so use kitchen gloves to handle the pan. Remove the bundt pan from the freezer after 30 minutes. Invert the bundt pan onto a cake plate and let it sit inverted for a bit to let the gravity do the work (it could take as little as half a minute or as long as 20 minutes, depending on your bundt pan). Then, gently lift the bundt pan and your cake should be released. Pour the lemon glaze over your cooled bundt cake and you’re done! And you don’t even need the lemon glaze. This cake is good as is! 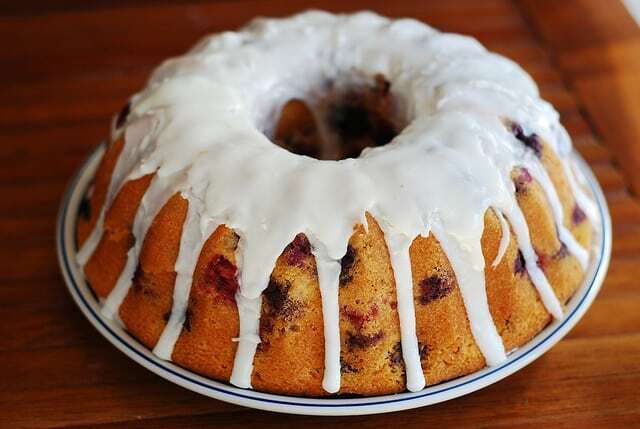 Ever since I made this mixed berry bundt cake, I’ve been on a bundt cake obsession and made quite a few more bundt cakes (apple cinnamon, chocolate, etc.). Apple Cinnamon Buttermilk Bundt Cake – this cake is made in a beautiful rose shaped bundt pan, and it makes a perfect coffee cake for breakfast! Dark Chocolate Bundt Cake – this is really one of the best chocolate cake you’ll ever try, and it’s made in a bundt pan! Apple Pumpkin Bundt Cake – one of my most popular recipes around the holidays! Save this recipe for the holiday season! Cranberry Apple Pecan Vanilla Buttermilk Cake – another great dessert for the holidays! Banana Buttermilk Bundt Cake – if you love bananas you’ll love this recipe! Can you tell I love bundt cakes?! 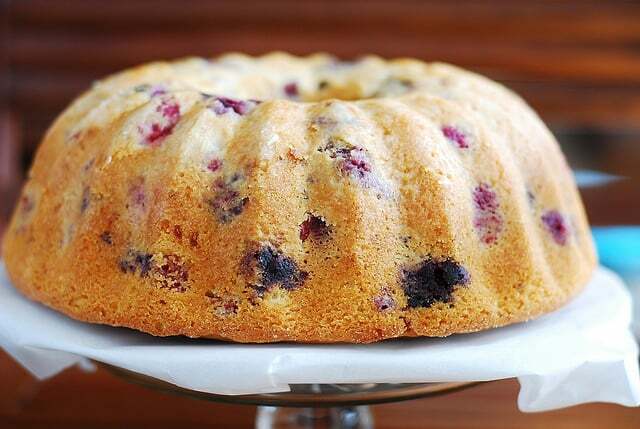 Mixed Berry Bundt Cake with Lemon Glaze - this cake is made with 3 types of berries all combined in one beautiful cake: blueberries, raspberries, and blackberries. Delicious Summer cake that can be made with either buttermilk, or Greek yogurt, or Kefir. This recipe uses 10-cup bundt pan. Preheat oven to 350 F. Use 10-cup bundt pan. In a medium bowl, mix 2 1/2 cups flour, baking powder and salt and combine thoroughly. In a separate large bowl, add together the softened butter, sugar and lemon zest and mix, using mixer, on high setting for about 5 minutes until even consistency is reached and the mixture reaches lighter color. 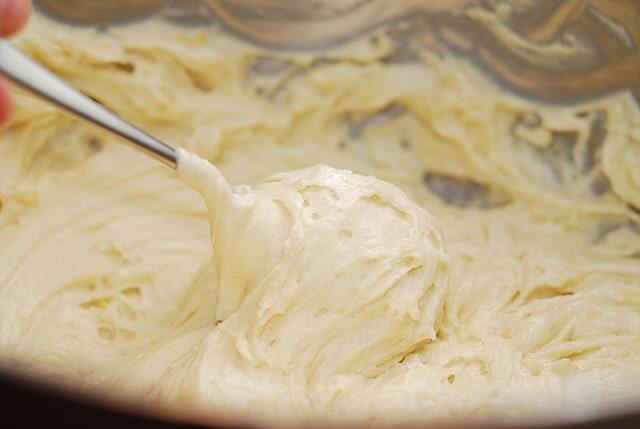 Add eggs, vanilla to the butter-sugar mixture and continue beating until well-incorporated. With your mixer on low speed, add 1/3 of flour mixture to butter-sugar mixture, beating just a little until all is well combined. Then follow by 1/4 cup of Greek yogurt (or buttermilk). Add second 1/3 cup of flour mixture, beating with mixer just to combine. Follow by 1/4 cup of Greek yogurt (or buttermilk), beating just to combine. Finally, add third 1/3 cup of flour mixture, followed by final 1/4 cup of Greek yogurt (or buttermilk). Again, beat just enough to combine. In a separate bowl, combine berries with 2 tbsp of flour. This is supposed to prevent berries from clumping together and sinking. Note about using frozen berries: I did make this cake with frozen berries without defrosting them. 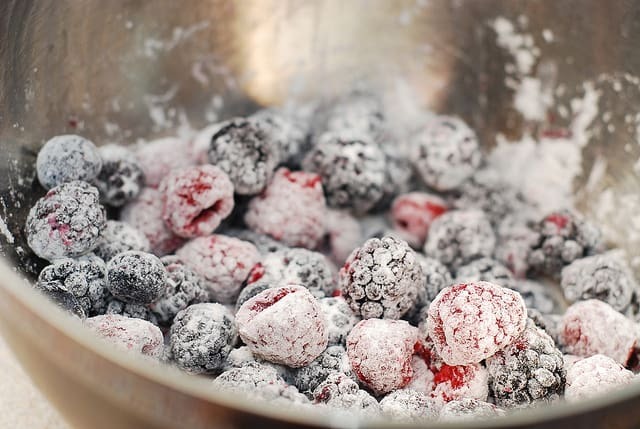 It's important that, if using frozen berries, they should not be clumped together, each berry should be separate (I freeze fresh berries by lining them on a cookie sheet). 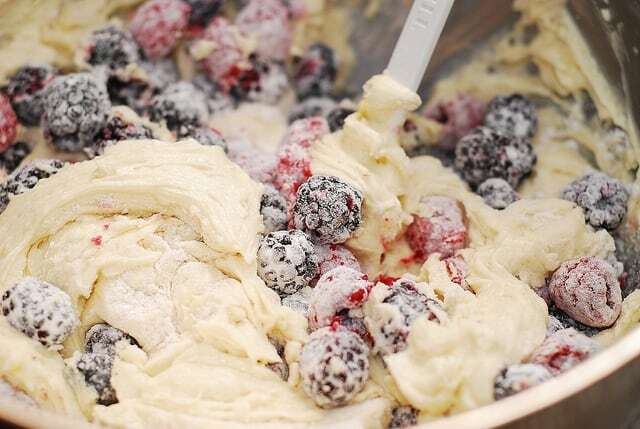 So you can use both fresh and frozen berries, and in either case you toss them with flour before adding to the batter. 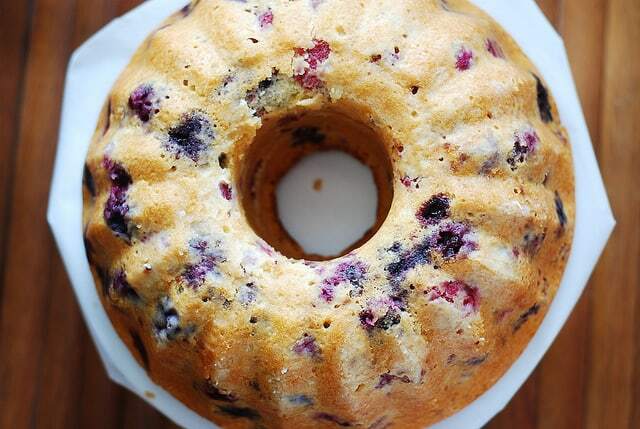 Use 10 cup bundt pan. Spray your cake pan with a Baking Spray with Flour (which works great for bundt pans). Pour batter gently into prepared pan. Remove the pan from oven, let it cool for 40 minutes on wire rack. After your bundt pan cooled off for 40 minutes, place the bundt pan in the freezer for 30 minutes - it will still be quite hot to the touch (even after 40 minutes of cooling), so use kitchen gloves to handle the pan. Remove the pan from the freezer after 30 minutes, invert the bundt pan and let it sit inverted for a bit to let the gravity do the work (it could take as little as half a minute or as long as 20 minutes, depending on your bundt pan). Then, gently lift bundt pan and your cake should be released. This recipe is adapted from Smitten Kitchen, where Deb adapted it from Rustic Fruit Desserts. 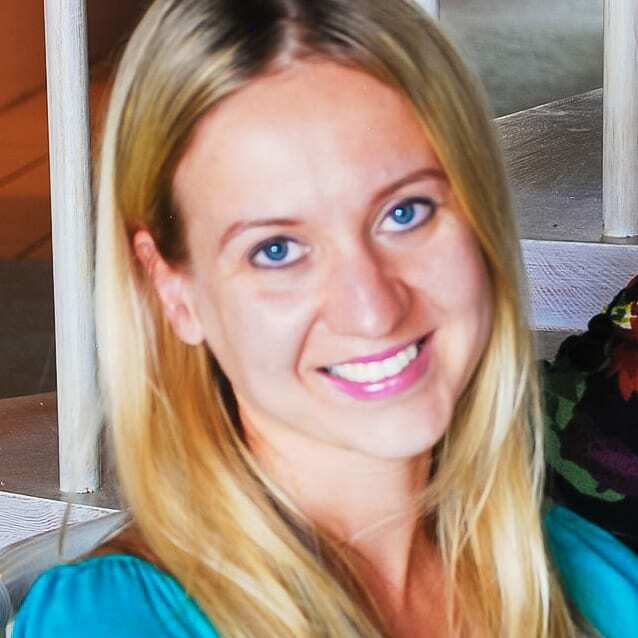 This recipe was originally published on October 3, 2012 and republished with updates, baking tips in May 2018. Yes, you can bake this cake a day before you’re ready to serve. Just keep it covered on the counter or you can also refrigerate it (covered). I don’t usually post but decided that this cake recipe deserved five stars and a big thumbs up. It turned out amazing . . . picturesque and yummy beyond description. . . . even though I substituted the 3/4 cup greek yogurt for two 100 gram containers of Activia yogurt . . . “red fruits and cereals” flavor of all things. I was searching for a recipe to use up a bag of store bought frozen fruits (strawberry, blueberry & cherry) and happened upon your website. This recipe is a keeper. I plan to start a new tradition in my family, and bake it every New Years to remind me that Spring is just around the corner. Yes, you can. You might need more than 1 muffin pan. And if using muffin pan the baking time would reduce to about 25 minutes. The cake turned out lovely but something went amiss with the glaze… I think the lemon juice curdled the butter. Any tips to avoid this? Make sure the butter is softened but not melted and not hot. The butter should be softened, still retain its shape, and be at room temperature (not heated). This should help. Can this be made not as a bunt cake but a round cake? Or would the recipe need to be different? It can definitely be made as a round cake. This recipe produces a lot of cake batter so you will have to use either a very large round cake pan that will not overflow, or use several round cake pans. And also watch the baking time as it might be different for a round cake pan. Mine cracked a huge crack around the center! Any ideas what I did wrong?! Yours looked so beautiful! Not sure what can cause this? All ovens are different. Try baking the cake at a slightly lower temperature and watch carefully for doneness. I tried the glaze three times and each time it looked like milk gone bad. Why is this happening???? I had the same trouble the first time. I made my own version to make it work. I did 1/2 cup butter, and the same amounts of lemon and powdered sugar as listed in the recipe. I also used a mixer because I got tired of whisking. I softened the butter and creamed that in the mixer. Then I add the powdered sugar in thirds to help it mix creamier. It should be thick and very creamy. Then I add the lemon juice last fully mixing one table spoon at a time. The lemon is what’s curdling your butter and sugar when you mix all at once. Give that a try! Hope it works better. Once you nail it, it’s delicious!!! For this recipe I used a 10 cup bundt pan, so plan accordingly for your 3 cup bundt pan. I’m not sure what measurements you are using to measure your bundt pan but this recipe nearly filled my 12 cup bundt pan which means it would have been too much for my 10 cup pans (all clearly marked as such). I used 10 cup bundt pan. I have a 10 c Brundtland pan and it worked beautifully. Rave reviews on this. In place of lemon glaze I dusted heavily with powdered sugar and then offered fresh whipped cream as a topper. BTW, could I use a 5×8 loaf pan and would I need 3 pans?